QR codes have had a lot of hype, and you see them around all over the place — from movie posters, to restaurant menus, to the roof of Facebook headquarters. But a common criticism of QR codes is that many people don’t see any real reason to scan them. 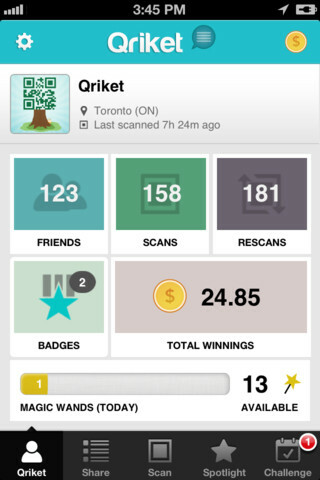 A startup we met in Toronto this week called Qriket says that it can give people a great incentive to scan QR codes: Its app, which is available for the iPhone, iPad and iPod Touch, enters people into a contest with the chance to get paid in cash each time they use it to scan a QR code. Qriket bills itself as essentially a game that bridges between the real world and the digital world of mobile apps. The money comes from companies who are happy to pay out as little as $1 and as much as $50 to make sure that people are engaging with their brands and the QR codes that they have incorporated into their marketing strategies. It seems to be taking off quite well: Since its launch in November 2011, Qriket has grown to a staff of 10 and has paid out more than half a million dollars to players around the world. The app’s top players each regularly scan hundreds of QR codes daily, so Qriket is showing that it has come up with something that’s sticky and addictive. Whether this will be a long-term solution to the problem of QR code traction or just a stopgap measure until QR codes fall out of fashion remains to be seen, but it’s clear that right now the Qriket folks have a very clever idea with solid execution. We pulled Qriket co-founder Ilya Spekhov aside at TechCrunch’s Toronto meetup to give us his pitch and quick look at the app in action for TechCrunch TV — you can watch that in the video embedded above.